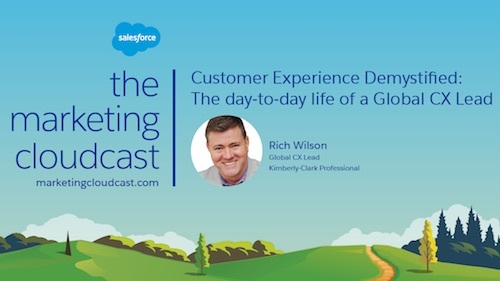 What is Salesforce Customer 360? 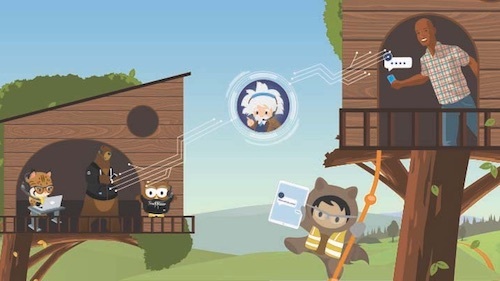 This is the first in a series of blog posts from the Salesforce Customer 360 team that outlines the product, how it works, and how you should be thinking about using it in your own business as we get closer to general availability. Customer 360 is in a closed pilot release today. It will be generally available in 2019. To start off this series, we want to give you some background on how we think about our existing products and how we can begin to improve them. Every company wants to deliver connected customer experiences across channels and departments. These experiences need to span siloed organizations, processes and infrastructure across marketing, commerce, sales and service. For customers of Salesforce B2B products, all information is in one place, in a single data model for marketing, sales, B2B commerce and service. This makes it easy for a marketer to see how their campaigns turn into leads, opportunities, pipeline, and sales. A sales rep can see support cases before they go into a meeting. Support reps can see open sales opportunities. Customer account hierarchies and contact relationships enable even deeper visibility. Sales Cloud, Service Cloud, Pardot, B2B Commerce, CPQ, Community Cloud, Health Cloud, Financial Services and Lightning Platform all use the same data model, called Standard and Custom Objects. Not only do they work together, the data is also available in Einstein Analytics and the Salesforce Mobile app. In the world of B2C, Amazon defined connected, cross-channel experiences. You get product recommendations on the website and mobile app. After you order something, you get emails and SMS messages, confirming your order, giving you shipping updates and cross selling related products. If you have a support issue, you can create a case and an agent will have all of the context they need to quickly solve your issue. They have blurred the lines between Commerce, Marketing and Service. Amazon created these experiences with an army of engineers. But traditional retail, CPG, banking, government agency or pharma companies struggle to deliver this type of experience. By themselves, they are great. But rolling out cross-channel use cases can still be challenging. In Sales and Service Cloud, B2C customer records are represented as Person Accounts Objects. In Marketing Cloud Email & Mobile Studio (f.k.a ExactTarget) subscriber tables are called Data Extensions. In Commerce Cloud (f.k.a. Demandware) customer tables are called Customer Records. It's up to the system architect to tie them together, resolve multiple records of the same customer across systems, and then roll out connected experiences. 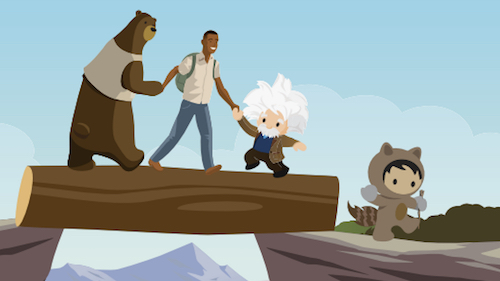 Salesforce Customer 360 is a new cross-cloud technology initiative that makes our B2C Marketing, Commerce, and Service products work better together. With Customer 360, administrators register their various instances of Marketing Cloud, Commerce Cloud, and Service Cloud. They map customer records from Service Cloud Person Accounts*, Marketing Cloud subscribers (Data Extension), and Commerce Cloud Customer Profiles into one, canonical view of the customer. Customer 360 does customer resolution – it assigns a unique ID to each person so it can stitch together multiple records of that person across different systems. For example, if John Doe is a customer record in Marketing Cloud, another record in Commerce Cloud, and another record in Service Cloud, the system knows that John Doe is one person, not three people, so we can engage him accordingly. Rather than replicating all of the related data (like cases and order history) into a central place, which it does not do, Customer 360 creates and stores a customer profile and acts as a hub that exchanges data and events across the systems at the time of need. Service Cloud Agent Console will include a reconciled customer profile, Commerce Cloud order, and shopping cart data, and the ability to order on behalf of a customer, all powered by Customer 360. Marketing Cloud will be able to trigger abandoned shopping cart journeys, triggered by the Commerce Cloud, powered by Customer 360. In addition, pre-built assets for things like journey templates will be delivered out of the box. Our immediate focus is on improving the experience within the B2C side of our solutions. However, it's important to state that this isn't our whole goal for Salesforce Customer 360. Many Salesforce implementations on the B2B side, especially those with multi-org deployments, could be improved with Customer 360. That's an area that we'll tackle in future blog posts. We’ll also look at how data is kept clean across all of these environments; and how this affects partners and systems integrators. To stay up to date on Salesforce Customer 360, sign up for our email list here: www.salesforce.com/customer360.